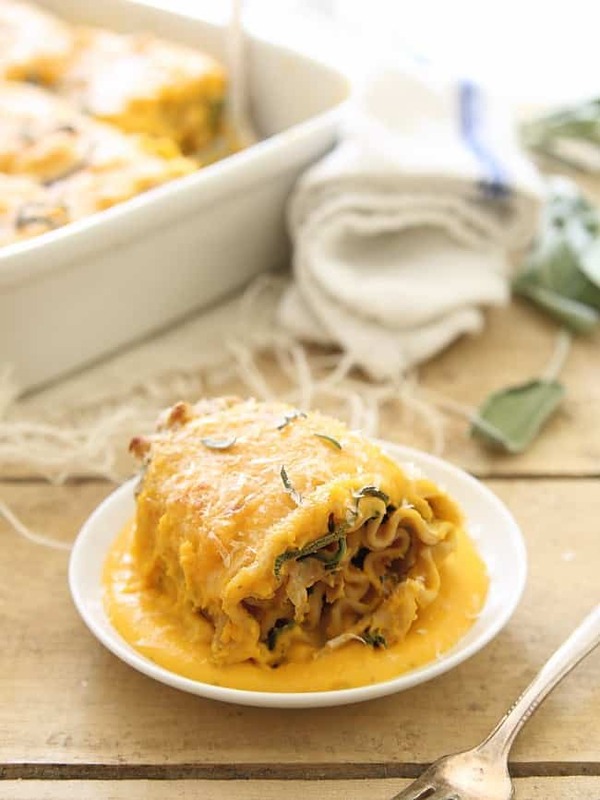 These butternut squash lasagna roll ups are stuffed with chicken and spinach and covered in a creamy, cheesy butternut sauce. 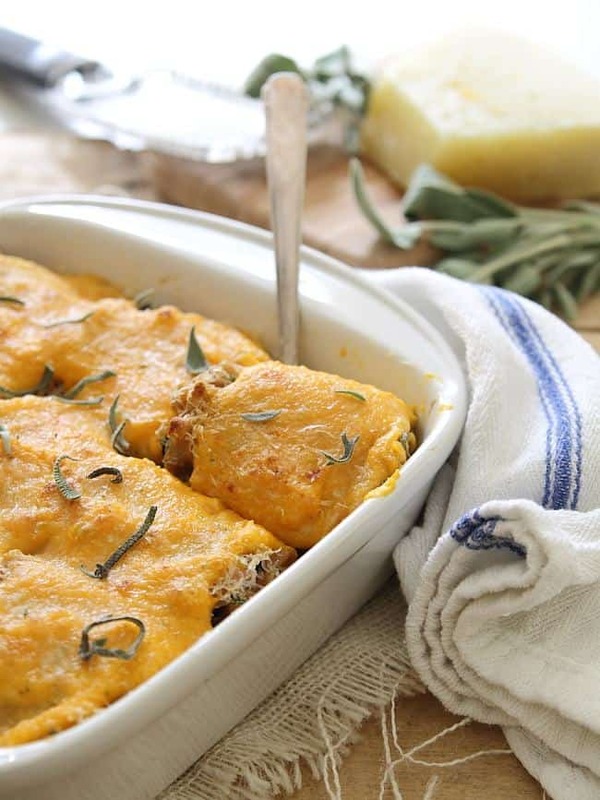 *Post updated 11/1/2017 to include a video on how to make these creamy, delicious Butternut Squash Lasagna Roll-ups. Watch below! Hope you enjoy this cozy fall meal as much as I do. There are some days you want a quick dinner. Then, there are some days where spending a couple hours in the kitchen, chopping, processing, sautéing and baking sounds like the perfect thing. I find that as the weather gets cooler with breeze blowing in through the kitchen window as I stand in my little nook between my sink and stove, I crave those longer kitchen days a little more often. 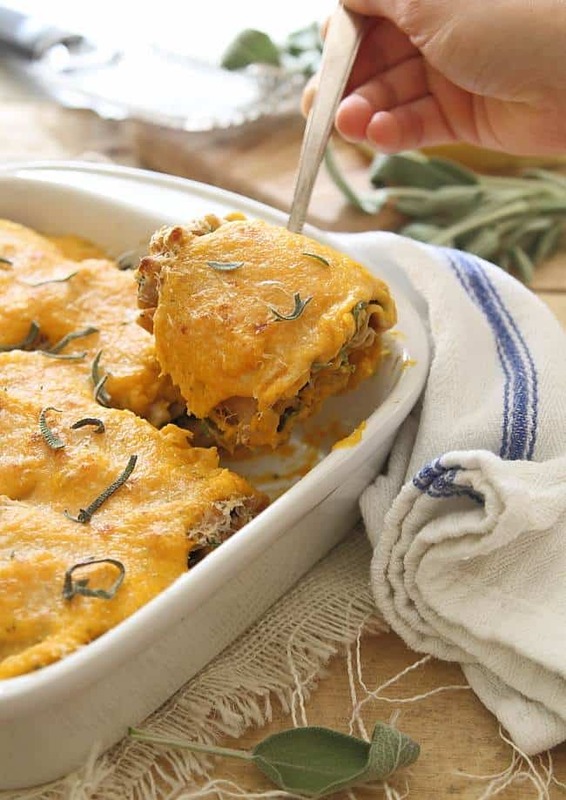 These butternut squash lasagna roll ups are just the thing for those kind of days. I’ll be honest, I didn’t really know where this recipe was taking me when I set out in the beginning. I had a butternut squash sitting on my counter for a couple of weeks, my first “fall” squash purchase when I got home from Europe. I had half a box of lasagna noodles I wanted to use up and leftover rotisserie chicken. About 30 minutes later, I found myself knee deep in the middle of this. As far as “winging” it goes, this has to be one of the better results. The butternut squash plays two roles; a creamy filling with the chicken and spinach and a thinner, cheesy sauce on top of the whole wheat noodles. It’s baked to golden brown and bubbly perfection. There’s just something about baked pasta that makes it even more comforting than it already is, isn’t there? And it’s worth every minute of the hour and 15 minutes it takes. Save it for a weekend if you must but, you must. Add butternut squash, cook for about 10 minutes until softened. Remove with a strainer (leaving water in the pot) and transfer to a food processor. In a small skillet, heat the olive oil over medium heat. Add the shallots, garlic and sage and cook for about 2-3 minutes until fragrant and softened. Transfer to the food processor with the butternut squash. Add the ricotta, 1/2 cup of the parmesan cheese, salt and pepper to the food processor. Process until the mixture is smooth, scraping down the sides as needed. Set aside. Return the pot of water to a boil. Once boiling, add the lasagna noodles and cook according to package directions. While lasagna noodles cook, combine the chicken and spinach in a bowl and set aside. Drain the noodles carefully (so you don't break them) and reserve 1/2 cup of the cooking water. Lay each noodle flat, spread 3-4 tablespoons of the butternut squash puree along the noodle. Spread the chicken and spinach mixture on top and roll the noodle up. Repeat with remaining noodles. Add the 1/2 cup reserved liquid to the food processor with the remaining butternut squash puree and process until smooth to thin it out. Spoon about 1/2 cup of the mixture onto the bottom of a 9x9 baking dish. Place the rolled noodles in the baking dish, seam side down. Pour the remaining butternut squash puree on top of the noodles in the dish. Top with remaining 1/2 cup parmesan cheese, cover with foil and bake for 30 minutes. Remove foil, turn oven to Hi-broil and bake for another 3-4 minutes until top starts to turn golden and bubbly. 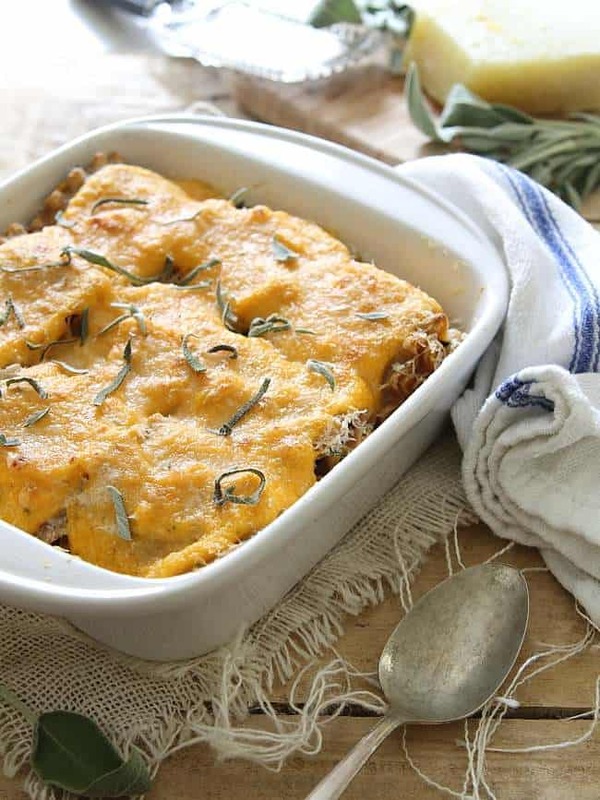 Remove from the oven, garnish with additional fresh sage and parmesan cheese. How funny, I made that last night too! Actually was thinking a similar thing about making a meal that takes a while, but you can be proud of it, and enjoy the process! I didnt do roll ups, but I did consider it! Perfect way to bring in fall, and start loading up on carbs for the marathon! Some meals are just worth the extra time, and this certainly looks like one Gina! Amazing! I love all these flavors rolled up together. I needed a new recipe for fall and this is it! This looks absolutely amazing. My family is not a fan of butternut squash (oh I know they are crazy!) But this may work perfectly for them. Can’t wait to try. And if they don’t like it, pretty sure I can handle the leftovers! I love the days when you can just spend a little quality time in the kitchen, laboring over something delicious. This is that exact recipe. I love it! I love putting butternut squash in EVERYTHING this time of year. Gotta try this! I love how butternut squash makes the sauce rich and creamy without being cream! Awesome Gina! I love when winging it ends up with delicious meals like this! This one looks like a winner! Hellooo to comfort food at its best! Love the recipe Gina! I just froze a bunch of pureed butternut squash for such a recipe as this! And I might just make the sauce and eat it on its own with a spoon because it looks ah-mazing. This looks beyond delicious! Thanks for sharing! I love those kinds of days in the kitchen sometimes too…and I love this! Butternut squash is a favorite for sure, and I can only imagine how creamy and tasty it makes these! I totally agree. . what is it about fall and winter that makes it ok to be cooking dinner for a while. . I guess when it’s cold out, you want to be next to a hot stove or oven. Anyway, I love everything about this meal .. I’ve done the lasagna roll ups before but this is brilliant. . love and pinned! Please what is the Nutritional information on this ?? ?